Can my staircase be stained & painted in my Toronto home? This is a familiar scenario: You have the flooring redone in your Toronto home and then realize that the staircase doesn’t match the new flooring. We can help! Many people are painting the wood on their staircases in a two-tone colour scheme and it looks fantastic! 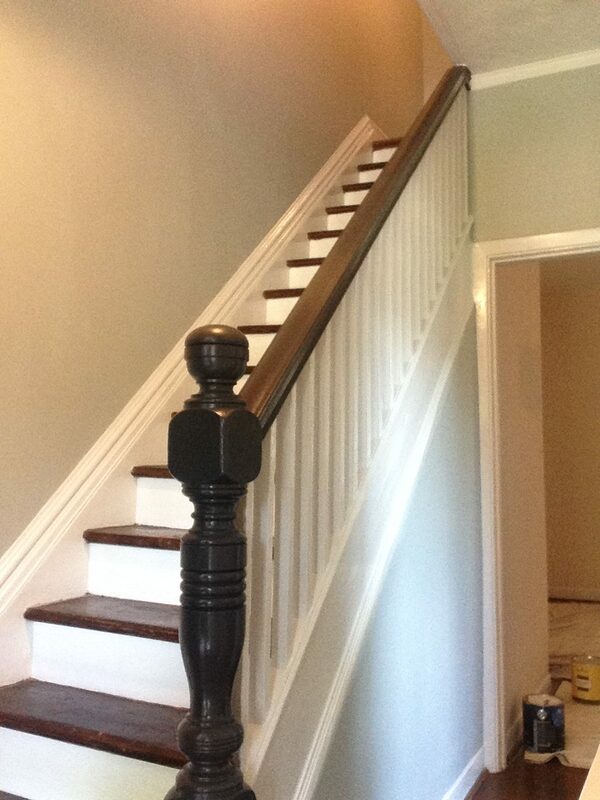 Or they paint everything but the stair tread – on that area they have it stained and varnished to match the flooring. If you want to do both stain/varnish and paint, the stair tread would be stained and varnished and the rest of the colours could be similar to the above scheme. 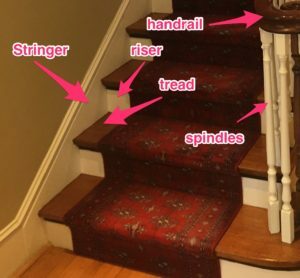 How do you ensure that the staircase is durable? 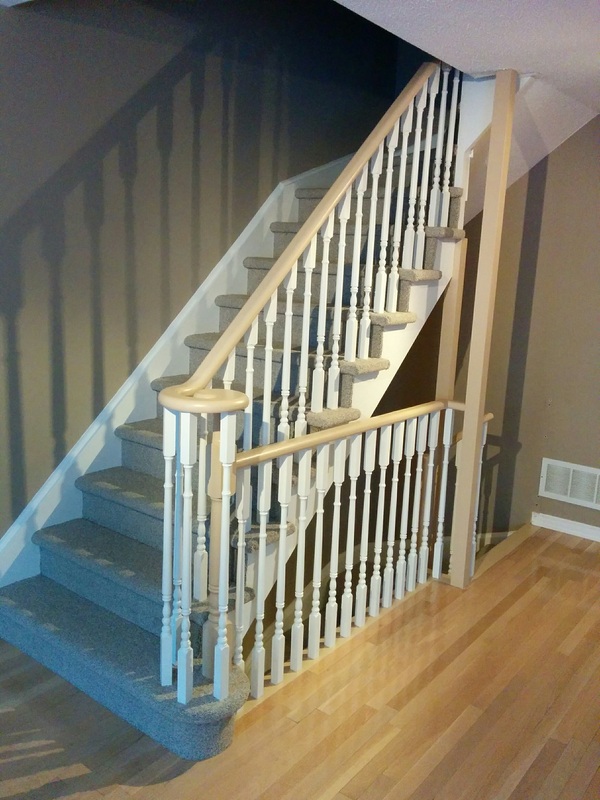 As you can imagine, stairs take a beating and it’s essential to have the most durable paint on them. If the stairs are currently varnished and we want to paint them it’s essential that we scuff sand the surface, this gives the primer something to grip on to. We prime the surface with low odour alkyd primer – latex primers don’t stick good enough for foot traffic and constant abuse. When staining and varnishing the stair tread we need to remove the existing coating all the way down to the bare wood. We apply two coats of finish – low odor alkyd paint on the stair tread, which is suitable for walked on surfaces, on the other areas we use a latex enamel suitable for trim. Generally we need to apply two coats of stain to get the wood to the right colour. After we apply the stain we put two coats of varnish on the tread, with a light sand in between coats. On the other areas we put two coats of latex enamel suitable for trim. How much does it cost to paint a stairwell? 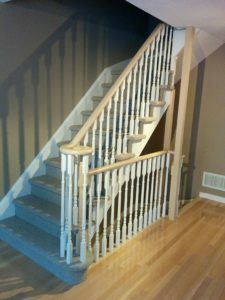 We’d love to update your staircase, so why don’t you book a quote? CAM Painters will Transform your Home With Lasting Beauty!